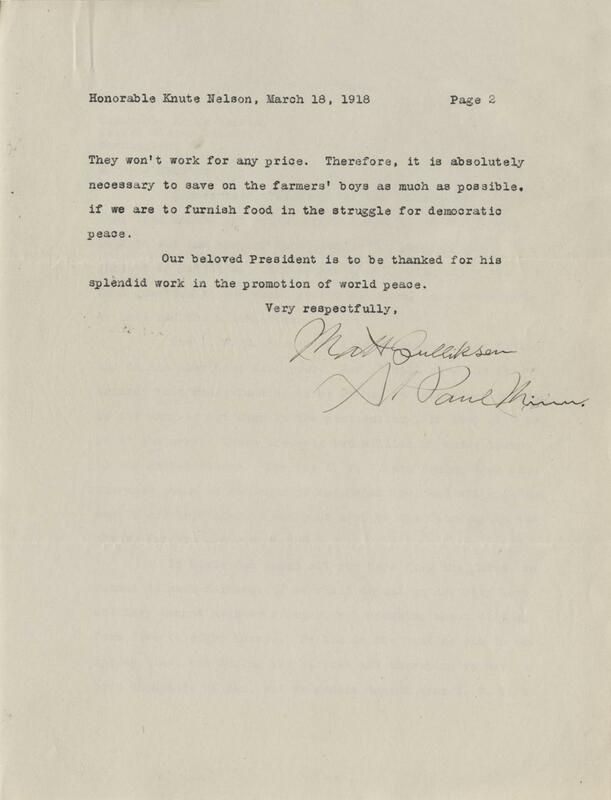 Matt Gulliksen of Saint Paul wrote this letter to Minnesota Senator Knute Nelson expressing his severe dislike of the IWW, (Industrial Workers of the World). He states that he has been traveling for the past four months looking to arrest members of the IWW. 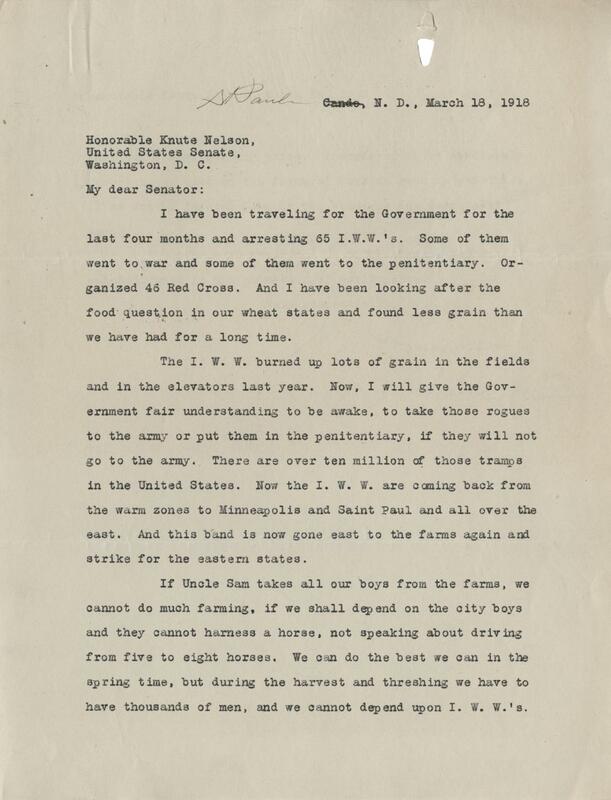 His main problem with members of the IWW is that in their protest for workers rights, they have been burning wheat fields during a time when the Unites States desperatly needs its wheat supply. The author continues on to explain that becasue most able bodied men are fighting in the war, there is no one left to farm. He states that the members of the IWW cannot be trusted to take on farming duties because of their history, and because of the fact that they will not work for any price. The author concludes that it is absolutly necessary to keep as many farming men at home as possible, so that they may keep up with the increased demand for food. I have been traveling for the Government for the last four months and arresting 65 I.W.W.'s. Some of them went to war and some of them went to the penitentiary. Organized 46 Red Cross. And I have been looking after the food question in our wheat states and found less grain that we have had for a long time. The I.W.W. burned up lots of grain in the fields and in the elevators last year. Now, I will give the Government fair understanding to be awake, to take those rogues to the army or put them in the penitentiary, if they will not go to the army. There are over ten million of those tramps in the United States. Now the I.W.W. are coming back from the war zones to Minneapolis and Staint Paul and all over the east. And this band is now gone east to the farms again and strike for the eastern states. If Uncle Sam takes all out boys from the farms, we cannot do much farming, if we shall depend on the city boys and they cannot harness a horse, not speaking about driving from five to eight horses. We can do the best we can in the spring time, but during the harvest and threshing we have to have thousands of men, and we cannot depend on I.W.W.'s. They wont work for any price. Therefore, it is absolutely necessary to save on the farmers' boys as much as possible. if we are to furnish food in the struggle for democratic peace. Our beloved President is to be thanked for his splendid work on the promotion of world peace.